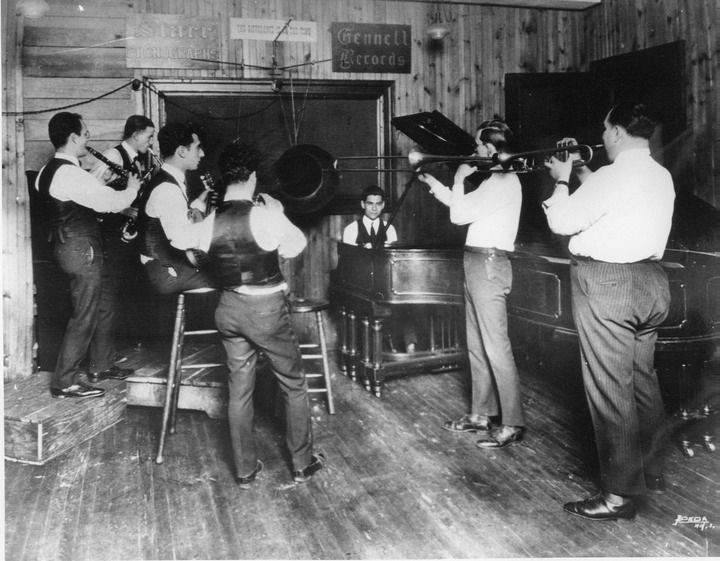 May 11th in Gennett History, 1923: Bailey’s Lucky Seven recorded “March of the Mannikins” in NYC. It appeared on Gennett 5153, Starr-Gennett 9382, and Apex 428. The recording featured Phil Napoleon (c), Charlie Panelli (tb), Benny Krueger and Loring McMurray (sax), Nick Lucan (bj), and Jack Roth (d). This entry was posted in Gennett, Gennett Walk of Fame, May, Video and tagged Apex 428, Bailey's Lucky Seven, Benny Krueger, Charlie Panelli, Gennett, Gennett 5153, Gennett Discography, Gennett Records, Gennett Walk of Fame, Jack Roth, Loring McMurray, May, Nick Lucas, Phil Napoleon, Starr-Gennett 9382. Bookmark the permalink. Loren McMurray is not on this recording – he died October 29, 1922.